The team at Stoneycreek Village Dental comprises of highly dedicated and qualified dental specialists with years of experience in preserving Fort McMurray smiles. Serving as the most comprehensive dental office in Fort McMurray, Alberta, Canada, we thrive to provide our patients with the highest standards of dental care. Here are some of the key reasons why you should become a new patient at Stoneycreek Village Dental. Usually, most of the dentists are unable to address the concerns of their patients effectively. They might use difficult jargons and technical dental terms which you might not understand. Our dentists at Stoneycreek Village Dental effectively communicate with patients using simple language, enabling them to understand and stay informed about their dental treatment. This provides our patients with peace of mind during their dental sessions and allows them to maintain healthy dental hygiene. The advancement in technology in medicinal science has a big impact on dentistry. The availability of non-invasive dental procedures has made life easier for both dentists and patients. However, patients still feel anxious and nervous about their dental visits, particularly children. 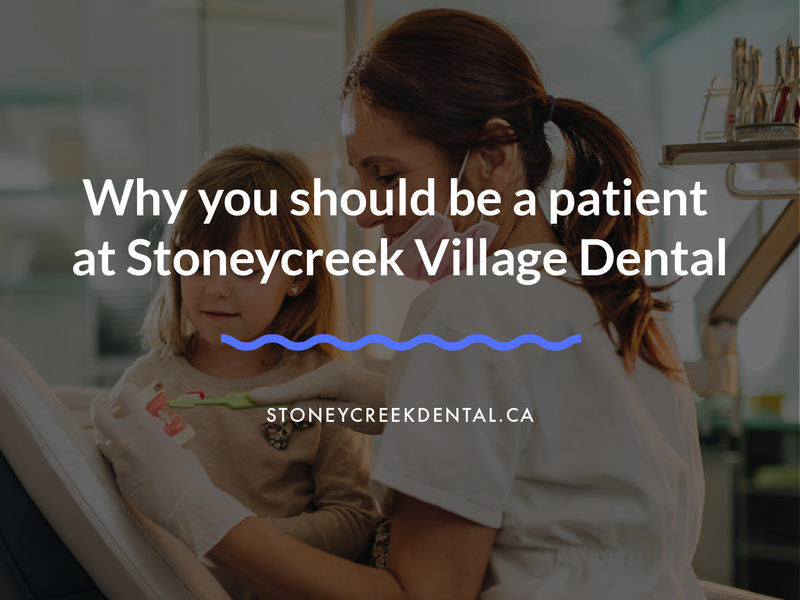 Our team at Stoneycreek Village Dental understands these concerns, thus provides gentle care and utmost comfort to our patients in a relaxing and positive environment. Most dental clinics just want to get the job done to accommodate the maximum number of patients, which often leads to slipups or ineffective treatment. At Stoneycreek Village Dental, we provide patient-centred services as we are committed to building a long-lasting relationship with our patients. We understand that each patient of ours comes with their specific needs and we ensure that all of their requirements are attended to with a comprehensive examination, open communication, and personalized treatment. We also make sure to devise a treatment plan which accommodates their busy schedule, so they don’t have to delay the treatment process. While dental sessions are booked via appointments, there are cases of dental emergencies which cannot be delayed. For instance, a person might suffer from toothache, bleeding gums, lost fillings or crown, or perhaps broken or chipped tooth. These issues can cause excruciating pain and discomfort, and require urgent medical attention. Our Emergency Dentist Fort McMurray is always there to tackle such situations by providing immediate dental care to alleviate the pain.